We are a tile and grout cleaning Sydney service fully equipped with skilled and professional cleaning technicians and provide all sorts of services including tile cleaning, grout cleaning, regrouting, tile resurfacing and colouring etc. Among the grout and tile cleaning services Sydney city offers, Tom’s Cleaning has years of experience and first line expertise in cleaning and repairing grouts and tiles for both homes and commercial premises. We are a tile and grout steam cleaning Sydney service provider and we can give your floor a new breath of life with our powerful steam cleaning. Steam cleaning helps in cleaning the floor tiles quicker, while ensuring that no damage is caused to the tiles. Deposits of dirt on the edge of tiles go deeper into the grout causing permanent damage to the floor. The professional grout cleaning service offered by us can help you regain the shine and glaze of the floor. Tile sealing is required to prevent stains and mould on the floor. Sealing applied in the right time can actually boost the longevity of the floor tiles. We are one of the most popular grout sealing service Sydney services to take care of all your sealing needs. If you think tile and grout cleaning is really a time consuming job and can actually take several days, we can make things easier for you by providing the service in the same day. We are even available in weekends and all public holidays. Do you need to give your tiles a fresh new look? Well, instead of going for expensive tile restoration you can just choose our tile resurfacing service. By just spreading a coating on your old tiles we can help you regain the new look and feel of your tiles. We also help you clean and give a facelift to your outdoor tiles like that of swimming pools or porch with our expert outdoor tile cleaners. Why hiring a professional service for tile and grout cleaning is important? Primarily it is the floor upon which your guests set their feet on and naturally it deserves the utmost priority for maintaining a clean and hygienic atmosphere. A dirty or stained floor is the biggest scar that gives a shabby impression about the interior no matter how hard you try. This is precisely why you need to clean your tile and grouts in the floor from time to time. Apart from the question of cleanliness and sanitation, clean and stainless tiles also last longer and are required far less replacement over a period of time. By making them cleaned with a professional cleaning service you can not only give your interior ambience a freshness but also can give the tiles a renewed and invigorated life. 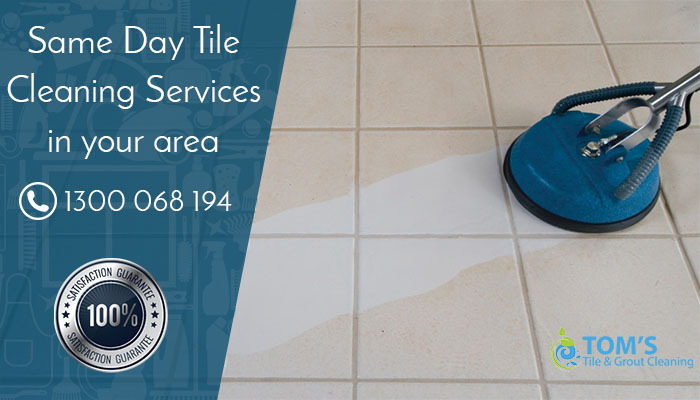 We as the most trusted name among the tile cleaners Sydney offers, can just ensure you to offer industry-standard cleaning procedures with high degree of effectiveness in removing the stains and giving your floor tiles a fresh new look. Let us have a look at the key processes we follow in tile and grout cleaning. we begin with a clear full inspection of your tiled floor and depending upon that we come with a suggestion for tile and grout cleaning or other services like sealing, resurfacing or others. Depending on the extent of cleaning and rejuvenation required we commit a time if completion for the task and the price quote for them. based on the nature of the accumulated dirt we apply the cleaning solutions on the floor that can be effective in cleaning the floor while preventing any damage to the floor. We apply powerful steam to clean the deep rooted deposits of dirt from the tiled floor. We use turbo machines to clean the floor from contaminants and dirt. After the cleaning of the tiles and grouts is done, we dry out the floor with industry grade mop dryers. 100% customer satisfaction is what we strive for with our tile and grout cleaning services. Our process never comes to an end without a satisfactory nod from our customers. If you wanted to transform the look of your tiles and grout area, feel free to reach us out at Toms Tiles Cleaning Services for Floor Tile Cleaning, Pool Cleaning, Bathtub Cleaning and Grout Cleaning. We are available for 24/7, if you have any emergency then we provide same day tile cleaning Sydney services just call us on 1300068194. We are one of the most sought after tile and grout cleaning services in Sydney with our customers spread across the city homes and commercial premises. Here are some of the key attributes that set us apart from the most tile and grout cleaning services. We offer value for money cleaning service with most competitive pricing. We guarantee 100% customer satisfaction with each and every cleaning service we undertake. Only certified, experienced and skilled tile and grout cleaners work with us. We use industry grade, biodegradable cleaning materials to prevent damage and ensure zero pollution. We undertake same day cleaning service and remain available for urgent service in all weekends and public holidays. Do your Sydney home tiles need a thorough cleaning? Do you need tile repair? Just drop us a message or give us a call and we are going to answer your queries within minutes.